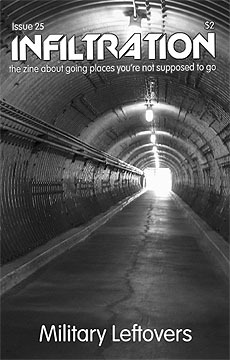 Infiltration: the zine about going places you're not supposed to go, is a paper publication devoted to the art of urban exploration, a sort of interior tourism that allows the curious-minded to discover behind-the-scenes sights and have a lot of free fun. Several people have given it nice reviews. Infiltration features editorials, exploring advice and information, articles on recent expeditions, and interviews, all illustrated with maps, pictures and diagrams. Be forewarned that the zine is black and white and non-glossy. The final issue of Infiltration (June 2005, issue 25) focused on military leftovers of all sorts. Unfortunately, because the zine is no longer currently in production, it is no longer possible to subscribe in advance.